..... Finally, locate the remaining part of the 10" x 20" block and size it as shown, in order to make the canard center section. Keep the unused portion for cutting the vertical fin, so don1t make the height over 6.0". Note the the 0.6" taper dimension is to allow for the proper anhedral angle upon assembly in the canard female jigging templates. 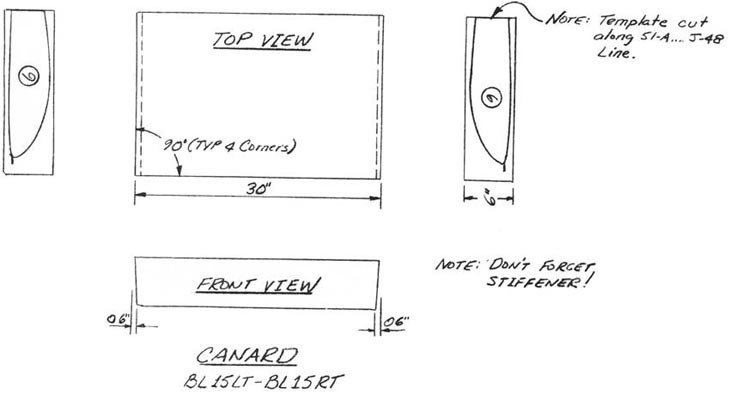 .....Take the two canard template BL48.8 and BL15 and remove the 33-A-B-C-D-E-F-38 notch in each template. Then, hot-wire the canard stiffener out of each inboard canard and canard center section foam core, being care ful to line the templates up properly. Store the stiff eners carefully to avoid damage. ..... Find the two pieces of foam that you saved after hot-wiring the inboard canard cores. (The areas are marked 'save' on the sketches). Add some additional scrap pieces, being careful to obtain proper skew throughout the setup, and make the inboard elevator cores. The template offsets are necessary to obtain the proper geometry. .....Hot wire for the elevator torque tubes like you did on the inboard elevator cores.